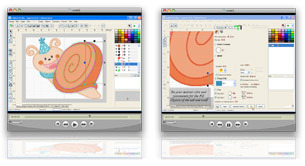 Follow this easy video tutorial and learn how to create an applique Snail design using Embird Studio. This video has no audio but you can read captions that will explain all the steps needed to perform in order to create this cute Snail design. Hello, my name is Fabiola Leone and I live in Italy. My passion for machine embroidery and digitizing was sparked when I first saw an embroidery machine at a hobby fair in Rome some ten years ago. Back then, we had cards and 4 inch hoops but when I discovered that I could combine my computer knowledge to machine embroidery, I was thrilled! I have been using Embird exclusively for three years now and all my spare time is dedicated to digtizing and creating embroidery projects. I have set up my own website www.chiocciolaricami.com to showcase my work and host a large number of video tutorials for Embird and Studio created by myself and Francesca Rosini with whom I collaborate with as group moderator to Embird Club Italia.